No, there may not be any sweeping sunrises or Elton John songs to show us the way, but nevertheless: Lion is coming. To prepare us for the changes ahead, Apple has posted a big summary on its website listing all of the more than 250 new features present in this version of OS X—but let’s be reasonable: As excited as you might be, you don’t have time to read up on every single one. Instead, let us do the work for you, and highlight some of the coolest new tricks your Mac will be able to turn in Lion. Taking one of many cues from iOS, in Lion, your Mac will be able to auto-correct your misspellings and accent your letters using the same bubbly pop-ups iOS device users have come to know and love. Misspellings will pop up under the word as you type, offering suggestions; accept one, and the word will gain a blue underline to indicate the replacement. You can add an accent a letter by holding down the key of the letter you wish to alter; after a moment, a pop-up menu will appear, showing all possible accented combinations. 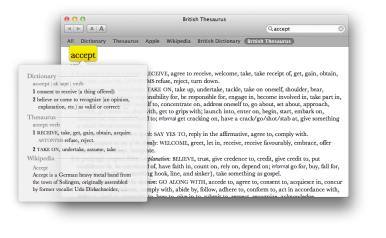 You’ll also be able to define any word and have the definition or Wikipedia article pop up inline. If you have a Magic Trackpad, you can use a three finger double-tap on a highlighted word (or group of words) to launch a pop-up showing its definition, thesaurus entry, and Wikipedia article (if applicable). You can also effect the same action by control-clicking. Searching in Finder and Mail will not only be made simple, but also more intelligent in Lion: When you type a query into the search box, your computer will offer up suggestions of what, exactly, it thinks you might be searching for. For instance, type in “photoshop” and you’ll get an offer to look for all Photoshop files on your hard drive. Select that, and you can stack additional queries on top of it—say, if you wanted to look for every PSD file named “hat”—to get more precise results. In high school, I lost a good third of my personal writing—and half of my first novel—after my father, in what I’m sure he meant as a well-intentioned move, replaced a folder called “Ren’s Stuff” on my laptop with a folder of the same name on our older, shared desktop. He thought he was consolidating my work; in reality, he was replacing it with documents eight months out of date. Now, I’ll be the first to admit that the real solution to issues like these is “Back up your work,” but Lion also goes so far as to remove this problem entirely with folder merge and file preservation. Now, when you attempt to move a folder to a location with another folder of the same name, your computer will ask if you’d rather merge the two together, rather than replace one with the other. Files are treated similarly: While you can’t obviously merge a file with another, your computer will ask if you’d like to keep both copies. Thinking about making the switch to the Mac? It’s simple in Lion thanks to the new Migration Assistant application, which lets you move files, user accounts, and more from your old PC to your Mac. 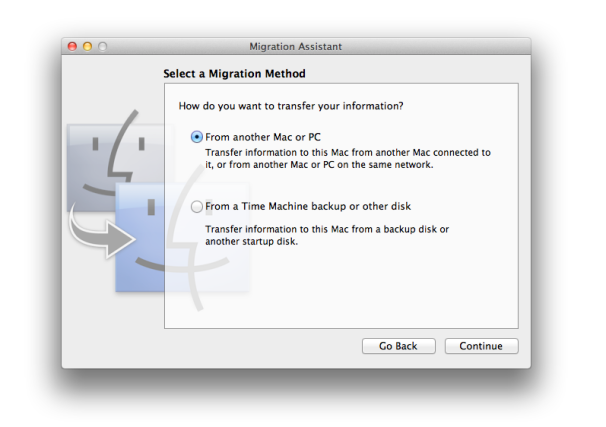 You can move your data after first getting a new Mac, or at any time from the Migration Assistant utility. Using Migration Assistant, you can transfer your user accounts and files as well as your e-mail, contacts, and calendars from select programs (Microsoft Outlook, Outlook Express, Windows Mail, or Windows Live Mail). To do so, you'll just need to install a small application on your PC, and use it to choose what you’d like transferred. 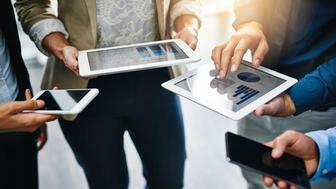 From there, you can move your files wirelessly over a Wi-Fi network, or through a wired Ethernet connection between the two computers. The next time you need to repair your disk or restore your computer from a backup, you won’t need to search for an external boot disk, those old restore CDs, a FireWire cable, or anything, really. In Lion, your computer will have its very own restore partition pre-installed. The partition—which takes up a measly 600MB or so—is all but invisible, tucked away in a corner of your hard drive until you have need of it. When you hold down the option key while booting your computer, the partition will show up next to your primary partition as Restore HD; click it, and you’ll be brought into recovery mode. Here, you can restore your computer from a Time Machine backup, reinstall Mac OS X, troubleshoot your system using Disk Utility, or get help online by using a built-in version of Safari. 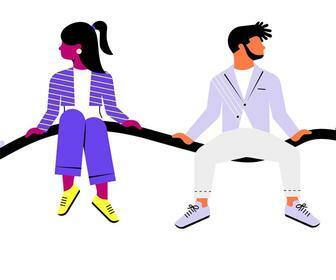 You can use the browser to access Apple’s Website, where you can make an appointment to see a Genius if you can’t figure out how to troubleshoot your problem on your own, or any other site on the Web.